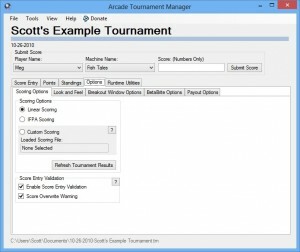 Scott’s Arcade Tournament Manager v1.7.0 Released! The newest version is here! Version 1.7.0 is a pretty big release. We have added many new features and fixed all of the bugs that have been reported. This version is solid, but we would still love to hear your feedback on new features, enhancements, and bugs that you may find. All Files now get written to a folder in your documents to eliminate the need to run the application “as administrator” in Windows 7 and 8. So I have been getting a few questions about how to properly connect an LED sign to my tournament software. It is actually pretty simple and I will walk you through it below. First things first, let’s talk about supported displays. Currently, I have only tested the software with my BetaBrite 213C and my Alpha 220C. These are some of the most common signs you can find that are affordable. The BetaBrite signs also came included in the Tournament TOPS Kits from Stern Pinball. I plan on testing other types and brands very soon. These signs use a serial (aka. 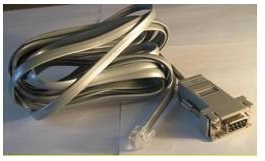 RS-232 or DB9) connection to your PC. This type of connection is now very uncommon and is most likely not included on that nice new laptop you bought. Don’t worry though, many products still use this protocol and there are USB to Serial Adapters available for cheap. I would recommend getting a USB to Serial adapter with the FTDI Chipset as I have not tested any other type. If you are lucky enough to have a serial connection on your PC then this is not a problem. I still like to use the USB to Serial adapter since it will also extend the range of the cable that came with your display. Speaking of which, you should have received a cable with your display that has a serial connection on one end and a network type plug on the other. If you do not have this cable, don’t worry as they are inexpensive and can be found on eBay. Once you have all the necessary cables you will need to hook them together and power up the display. Configuring the sign to work with the software is probably the easiest part. The one thing you will need to know is what “COM Port” number that your serial connection is set to. This is a whole number that is usually under 10. You can find this number by going to your control panel in windows and selecting Device Manager. Your serial port will be listed under the “Ports” section and have the COM Port displayed in the title. Once you have this port number, you can now open up the Tournament Manager application. At this point be sure that your display is connected properly and powered on. Click on the options tab and then click on the BetaBrite Options tab. First select the COM port for your serial connection and then check the “Primary Display Output Enabled” checkbox. 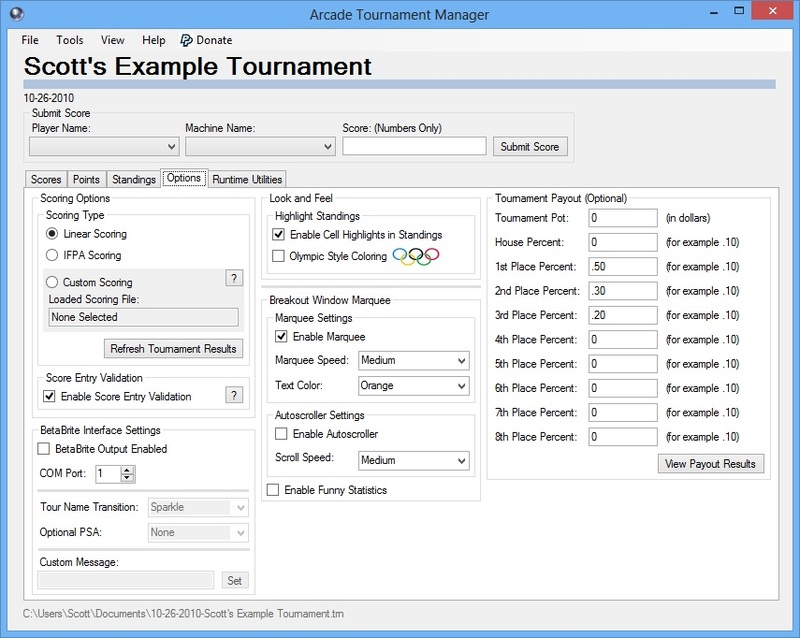 I have decided instead of cluttering up the internet with minor update message about the Arcade Tournament Manager, I would create a mailing list for those interested in keeping up-to-date with the latest version of the software. I will be using this mailing for only for updating people interested when a new stable version of the software is available. I will not sell or distribute your information to anyone. So the latest build is out! You guys have been a great help in finding bugs and recommending changes to the application. It is much appreciated. 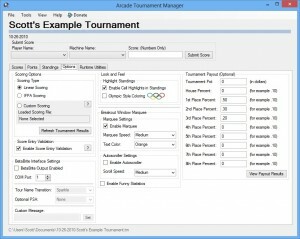 To get the latest version of this software go to the Arcade Tournament Manager Page. I know, I know, it has been 2 days since I released v1.6.0. I have been getting a tremendous amount of praise and feedback, so I decided now would be a good time to address a few of the user requests. Below I have listed a few of the updates in this version. Sorry if your request did not make it into this version, I will get the good ones in as soon as I can. As always, let me know if you find something that is not working properly or if you have any ideas on how to make this application better. The biggest and most exciting addition of this version is the code to control a Classic BetaBrite LED Sign! To control the sign, I modified an API that a guy named Jeff Atwood created for the .NET Framework back in 2005. This API enables the Tournament Application to control the sign with the highlights of the tournament. 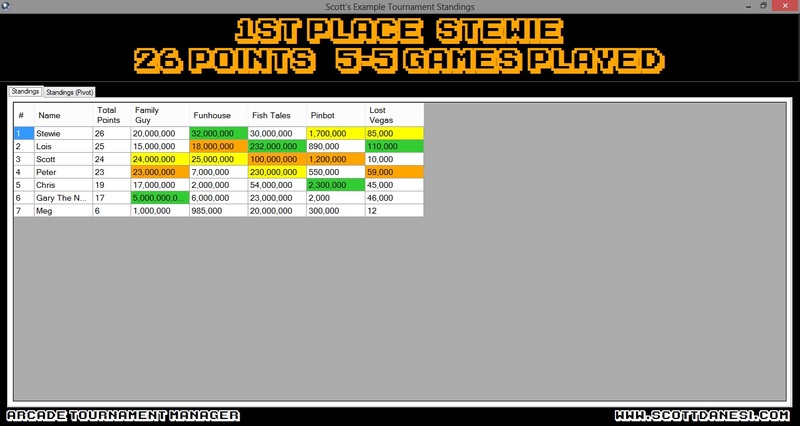 I have recorded a video of the early version of the Tournament Application displaying information on the sign. You can sort-of get the idea from the video below of how cool this could be for a tournament. I have added many more features that aren’t present in this video so stay tuned.